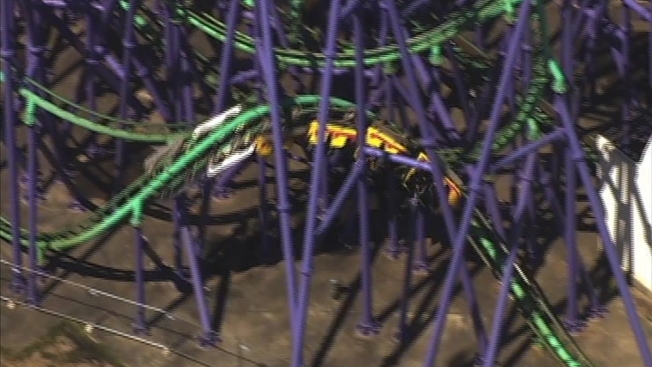 Joker's Jinx which got riders stuck in midair for more than three hours is back in service. Raw video of the ride that got stuck with 24 passengers high above the ground at Six Flags America in Prince George's County, Maryland. Joker's Jinx is back in service Tuesday. 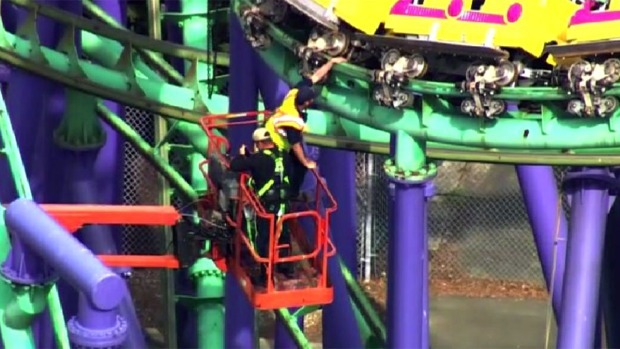 The roller coaster that stranded 24 riders in midair for more than three hours last week is back in service at Six Flags America in Prince George's County, Maryland. The Joker's Jinx coaster stopped about 6 p.m. that night, leaving riders as young as 6 years stuck at a 30 degree angle while 80 feet in the air. Firefighters used a hydraulic crane to rescue passengers one at a time. The last person was safely removed from the ride after 9 p.m.
Six Flags America in Prince George's County, Maryland, was open for business Friday but the Joker's Jinx remained shutdown. Two dozen riders got stuck on the coaster for hours on Thursday. News4's Chris Gordon reports the ride was inspected recently. The roller coaster accelerates from 0 to 60 mph in about three seconds, according to the amusement park's website. It features a "spaghetti bowl" design with various loops and turns. It usually takes just a minute and 15 seconds to complete, but not for the riders Thursday. The same ride got stuck with two dozen people aboard in August 2014. Corporate engineers and certified technicians identified and resolved the problem with one of the wheels on the train that got stuck, a Six Flags spokeswoman said in a release Tuesday. 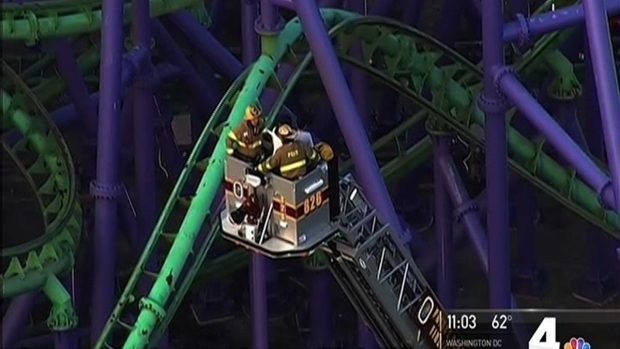 Twenty-four people riding a roller coaster were stuck in midair for more than three hours when the ride froze Thursday evening at Six Flags America in Prince George's County, Maryland. "Please know the safety of our guests is always our top priority," said Communications Manager Denise Stokes in the statement. State ride inspectors cleared the ride for service, she said.